This week we plan to do some activities for Dental Health month. We will talk about foods that are good for our teeth, and foods that are not good for our teeth. We'll have visit from a dental hygienist which is always great fun. I don't have many different crafts for this theme, but I will share with you what I have found. I first wanted to share some fun things I found in my Feb./Mar. 2003 Mailbox Magazine, kindergarten edition. The first project I thought was very beneficial for introducing children to using dental floss. The idea was submitted by an Erin Wernimont, Platteville, WI. Cut the egg cartons in half so you have two strips. Glue the strip to a piece of construction paper. Use a knife to cut slits between each egg cup. Tape the paper to the table, give the children some floss and allow them to practice flossing the "teeth." The next project is a two day activity to help the children learn the importance of brushing their teeth. This was also submitted by Erin Wernimont. On day one have the children cut out two lips and glue them to a large piece of paper. Next let them add some teeth using some white paper cut into squares. After the children leave for the day, use a yellow marker to color some of the teeth yellow. The next day explain to the children that some plaque has formed on the teeth and they need to be brushed. Let them use a toothbrush and some white paint to make the teeth clean again. The final project I found in the book which I thought was pretty neat was focused around brushing molars. Show the children where molars are located and explain that sometimes these teeth get missed when we brush. Today's activity would involve practicing brushing our molars. This project was submitted by Joy Meyer, Stoughton, WI. The first big step is to cut the bottom of the two liter bottles and turn them upside down to look like big molars. Next add some ketchup to them. Have the children put some toothpaste on their toothbrush, brush the molar, then rinse with the water. All clean! 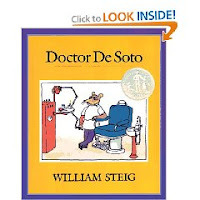 One of my favorite books for this theme is "Doctor DeSoto," by William Steig. This story is about a mouse dentist that takes care of all the dental needs of his animal community. His one rule is that he will not treat a fox. One day a fox comes with a horrible toothache and begs Dr. DeSoto to take care of him. The doctor is a bit apprehensive, but feels sorry for the fox. So he removes the fox's bad tooth, but has to replace it with a new one at a later date. Sly Fox has plans for Dr. DeSoto, but does Dr. DeSoto have plans for Sly Fox? I hope these projects can help you get started with your Dental Health activities. I will share you with your our projects this week as we finish then. so cute. I just did a dental theme in my class too. We did a fun project where I made a big red smile and then the kids glued white beans in two rows of ten. They turned out cute! Okay- those are just about the most adorable hands-on activities I have seen for dental health!! So much fun for the kids while they learn an important habit! !